From Newbern we got on the Wilderness Road (County Rd 611) to Radford. 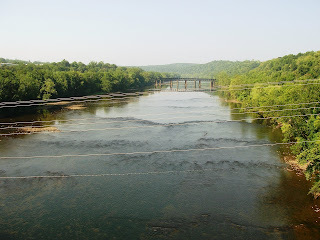 We were soon parallel to the New River and had to cross it on Hwy 11. 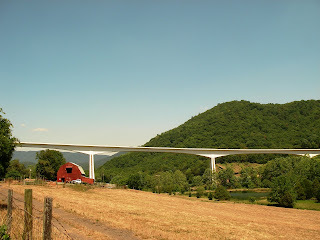 We have ridden over 44 miles on Hwy 11 and will continue to ride on it in strategic spots. It is the old highway and is very well graded and lightly travelled. We passed through Radford and by a variety of county roads (including lucky number 666) got to Christiansburg around noon. We had some business at the post office since we had decided to forward the 15 lbs. of gear we sent from Hindman on to Williamsburg. After this was done we headed out of town into a 3 mile descent to Ellett via county road 723. Just before Ellett we saw this unusual bridge and have heard that it is part of an experimental highway to test new technologies. We turned east on 785 (Old Blacksburg Rd.) 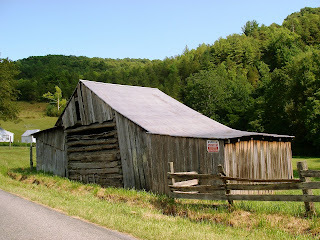 and had a beautiful ride through many old ranches along the north fork of the Roanoke River. When we got to the store in Catawba we were bushed and called our host for the night, Bill. We were introduced to Bill and Annie via email through Carolee, a good friend in Salinas. Bill's directions had indicated a serious climb to get to their house and when we called he said he would come meet us at the store. He pulled up in a pickup truck and we were saved! It took two trips and we soon were sipping on cold beers and looking forward to a home cooked meal.